Illinois Vision 20/20 will continue to focus on key priorities that aim to meet the initiative’s ultimate goal, fulfilling the promise of public education in Illinois. Among the core issues at the top of the 2016 agenda are teacher recruitment and retention, mandate relief, and equitable and adequate funding for Illinois public schools. While budget gridlock has dominated the statehouse for nearly a year, some education issues have continued to find support from both parties during the stalemate. Governor Bruce Rauner has repeatedly insisted that K-12 funding be spared from the budget gridlock and lawmakers have been quick to sponsor recent Vision 20/20 proposals. Toward the top of the wish list this year is the cornerstone for the Vision 20/20’s Equitable and Adequate Funding pillar, based on an “evidence-based” funding model. While the actual language is still being negotiated, the overall concept has been assigned to Senate Bill 2759, sponsored by Senator Jason Barickman (R-Bloomington). Changes to the state’s education funding formula could become a main point of emphasis during budget negotiations, lending credence to the Vision 20/20 proposal urging a comprehensive funding model that can be crafted for every district and every student to receive a quality education in Illinois. While changes to the way schools are funded is an important component of the Vision 20/20 initiative, other measures may find an easier path toward approval. Educator licensure reciprocity has been a popular topic for state officials in recent years. In 2015, a Vision 20/20 reciprocity agreement became law with the hope of attracting more teachers from other states. This year, Senate Bill 2912 aims to further that law by creating additional flexibility for teachers from out-of-state to obtain licenses to teach in Illinois classrooms. The legislation also creates a new, short-term substitute teaching license to help the many schools that have found it increasingly difficult to find regular substitute teachers. Another topic being discussed by the governor and legislators is unfunded mandates. While new mandates without dedicated funding sources have long been an obstacle for school districts, the budget impasse has renewed a focus on the topic as a way to relieve some funding pressures at the local level. “We’re gaining momentum in raising awareness about the problems unfunded mandates cause school districts,” said Ben Schwarm, IASB deputy executive director. “Many of our proposals have been embraced by the lieutenant governor’s mandates task force and others. Vision 20/20 has drafted legislation to give local districts options to manage mandates that are not backed by state funding. The first, Senate Bill 3098, would repeal the driver’s education mandate, one of the most costly to schools. SB 3098 would allow districts to instead contract with a commercial driving training school, without a waiver from the Illinois State Board of Education, to provide the service at a cheaper cost. The school board would be required to hold a public hearing on the proposal before a contract is finalized. Another proposal, House Bill 6164, would give districts the opportunity to enter into third-party contracting agreements, including for driver’s education and other non-instructional services. The proposal acts to remove the comparable benefit clause schools are required to abide by when contracting with third parties. It also would allow for districts to create additional provisions in which students may opt-out of physical education courses, provided that the local board of education holds a public hearing on the changes prior to any vote. Another bill takes a more comprehensive approach in addressing the perennial issue of unfunded mandates. Senate Bill 3182 would create the Local Unfunded Mandate Exemption Act. This legislation would permit all local units of government, school boards included, to exempt themselves from specified mandates that are not funded if compliance with such mandates is not economically feasible. Federal and health, life, and safety mandates could not be waived. A public hearing would be required and the elimination of such mandates would necessitate a majority vote by local school boards. “We are confident that these proposals will be on the table for discussion as legislators and leaders work towards larger bill packages regarding the budget stalemate,” Schwarm added. Since the Vision 20/20 campaign was launched in 2014, 522 school districts representing more than 800,000 students have pledged support. Information about the initiative and access to additional resources are available at the Vision 20/20 website. Applications for the 2016 Holly Jack Outstanding Service Award are now available. School districts are encouraged to nominate individuals who dedicate their time and effort performing the work of the board secretary. Created in 2009, the Holly Jack Award honors the memory of longtime IASB administrative assistant Holly Jack. She was instrumental in developing the professional development programing for secretaries that is offered each year at the Joint Annual Conference. Applicants must be local district employees (superintendent’s secretary, superintendent’s administrative assistant, or school board recording secretary) who have performed the duties of a board secretary for a minimum of five years. In December, the Illinois Association of School Boards announced the retirement of General Counsel, Melinda Selbee, after 26 years of service with the Association. It was also announced at that time that IASB’s Assistant General Counsel, Kimberly Small, would take the reins in the general counsel position. 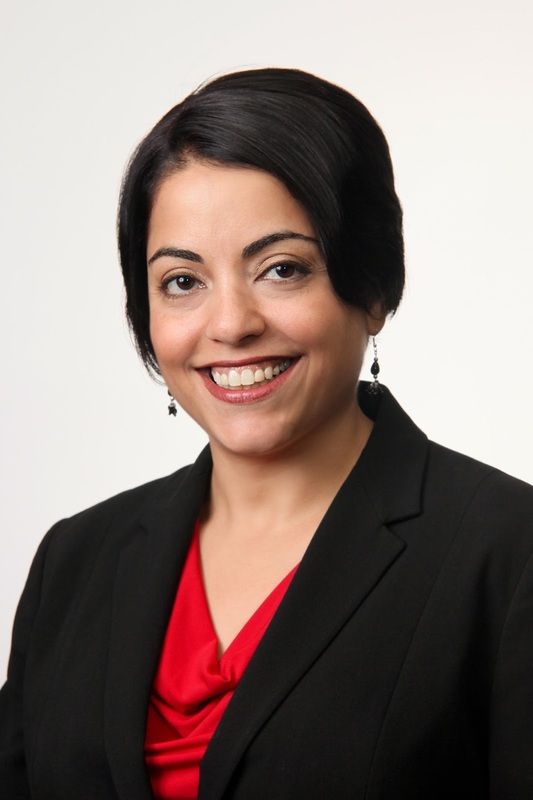 Now, after a several-month search, IASB has announced that Maryam Brotine has accepted the position of assistant general counsel. Brotine is currently working as a senior associate with the law firm Robbins, Schwartz, Nicholas, Lifton & Taylor, Ltd., Bolingbrook, where she practices school law. Brotine will start her duties at IASB on April 11. Brotine graduated from the University of Illinois in 2000 and received her juris doctorate from DePaul University College of Law in 2004. She has served with Robbins Schwartz since 2008, focusing in the areas of special education and students’ rights. Brotine counsels and represents school districts with respect to IEP meetings, ISBE complaints, OCR complaints, mediation, due process hearings, residency hearings, student discipline, policy decisions, and FOIA requests. Prior to joining Robbins Schwartz, she served as a supervising assistant public defender with DuPage County. Brotine has been active in the Illinois Council of School Attorneys and other professional legal organizations, and is a regular panel presenter at Joint Annual Conference and contributor to legal publications. Recent legislation referred to as SB 100 (P.A. 99-456) significantly amended student discipline statutes. Advocates had urged dramatic changes to Illinois’ student discipline law to overcome what they called the “school-to-prison pipeline,” and the practices that allegedly drive students out of classrooms and into the juvenile justice system. The legislation’s goal was to refocus disciplinary practices on education rather than exclusion. The Illinois Statewide School Management Alliance originally opposed the bill but eventually removed its opposition after negotiating with lawmakers to remove provisions that would have stripped local school management from much disciplinary authority. The Alliance worked with the sponsors and the bill’s supporters for over a year before reaching the final negotiated legislation. Though school districts could still face challenges implementing the new law, the Alliance was able to preserve the safety of students and staff as a priority in the legislation. While the bill won’t go into effect until Sep. 15, school administrators and attorneys are already preparing to comply with the new requirements. IASB policy staff dedicated PRESS Issue 91 to the subject and urged school boards to work with their local school attorneys to adopt the revised policies now. There’s a new twist to the review process for proposals submitted as Share the Success panels for the 2016 Joint Annual Conference. In past years, the panel review committee met at IASB offices in Springfield and Lombard for a full day of proposal reviews. This year, for the first time, most of the reviewers are working from the comfort of their own computers. What hasn’t changed is that the members of the panel review committee are volunteers from Association school boards. IASB field service directors nominated school board members from their divisions to serve on the panel review committee. Nominees were contacted by IASB, and those who agreed independently reviewed and evaluated the proposals using an online survey format. The 2007 Illinois Teacher of the Year moved beyond state recognition and went on to earn global acknowledgement this year. 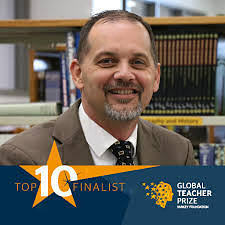 Effingham CUSD 40 high school teacher Joe Fatheree was a top-10 finalist for the 2016 Varkey Foundation Global Teacher Prize, known as the “Nobel Prize” of teaching. The prestigious prize comes with a $1 million prize for the winner, and although Fatheree did not ultimately win (the prize went to a Palestinian teacher from Bethlehem on March 13), he put Illinois schools and his local district on the map for educators around the world. During his 25 years of teaching, Fatheree had noticed that the textbook teaching methods he was taught were not as effective as hoped. Instead, he used out-of-the-box approaches to keep students engaged and saw a drastic improvement in achievement. When former IASB President Joe Alesandrini presented a resolution on behalf of Pekin Community High School District 303 to the Association’s Resolutions Committee last July he was hoping to gain the support of his fellow Illinois school board members. Now, the stakes are higher as Alesandrini is working to gain the approval of the Illinois Senate. The resolution District 303 proposed arose from a problem involving their building trades program. In order to keep their home construction program viable for future students, they had to ensure they were able to sell the student-constructed homes. After having an offer fall though due to difficulty with the closed-bid process, the school district decided the best solution would be to list the residence with a realtor. Under current Illinois law, districts must first go through the sealed-bid process, which can take between 60 and 90 days, before seeking the assistance of a realtor. The resolution presented by Pekin High School and approved by the 2015 Delegate Assembly seeks to give districts the choice of avoiding the bid process altogether and instead have the property listed with a realtor immediately. The IASB governmental relations staff worked with the district to draft a bill and find a sponsor. Senate Bill 2823, sponsored by Senator Dave Koehler, aims to give districts greater flexibility in how they sell homes constructed or renovated by students. The legislation would allow a school board to use the services of a licensed real estate broker to sell the property for a commission not to exceed 7%, contingent on the sale of the property within 120 days. If the video is not displaying correctly, click here. After a unanimous vote by the Senate Education committee on March 8, SB 2823 will be considered by the full Senate. IASB Deputy Executive Director Ben Schwarm sat down with Assistant Director Zach Messersmith to discuss Tuesday’s primary election results and how the outcomes may impact the current legislative environment at the Capitol. If the video is not displaying in your browser correctly, click here. The Illinois Senate was in session this week and continued the consideration of Senate bills in committees. The House of Representatives has been off the last two weeks and both chambers will be out of session for the next two weeks. The House returns to the Capitol on April 4 while the Senate reconvenes on April 5. Lawmakers are then scheduled to work steadily throughout April and May. There was no apparent movement among Governor Bruce Rauner and the Democrat leadership this week on any budget issues. However, before joining the House of Representatives on spring break, the Senate voted 39-18 to appropriate an additional $4 billion for the current fiscal year. The money in Senate Bill 2059 would be earmarked for higher education and other state expenditures that have gone without funding during this extended time without a budget. As has been the case with many other appropriations bills over the past few months, the Senate Democrats stood by SB 2059 saying that it is what was needed to ensure that state services can continue. On the other side of the aisle, Republicans responded that SB 2059 did nothing more than add to the already substantial backlog of bills in the state of Illinois. Senate Bill 2059 will now go the House where it is unknown whether or not it will be acted upon. 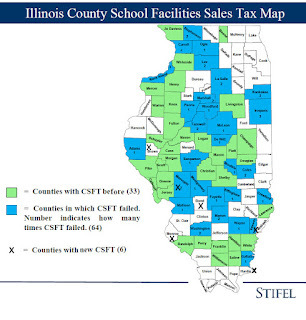 The unofficial school referendum results in the March 15 Illinois general primary election indicate that five of 11 tax increase questions, nine of 18 bond propositions, and six of nine county sales tax proposals were approved by local voters. Tax rate propositions were successful in Grand Prairie CCSD 6, Centralia; Lexington CUSD 7; Reavis THSD 220, Burbank; Roselle SD 12; and St. Libory CCSD 30. Voters rejected tax propositions in Liberty CUSD 2; Neoga CUSD 3; Peotone CUSD 207U; Pinckneyville CCSD 204; Streator ESD 44; and Taft SD 90, Lockport. Building bond issues were approved by voters in Burbank SD 111 in Cook County ($27 million to replace Burbank Elementary School); Dongola CUSD 66 in Jefferson County ($400,000 to repair and equip two existing schools); Midland CUSD 7 in Marshall County ($9.8 million to acquire and improve a school site, and build and equip a new building); Morton CUSD 709 in Tazewell County ($10.5 million to make repairs and additions to three elementary schools and two junior high schools); and Winthrop Harbor SD 1 in Lake County ($6 million, to build and equip additions to one school). Most of the building bond issues were approved by wide margins, although one was approved by fewer than 100 votes. team progress. (Photo: Lynn Trautmann). 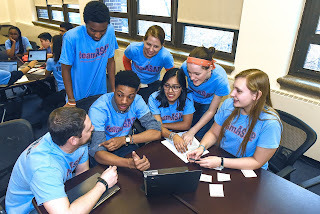 Evanston Township High School District 202 has been named a first-place winner in the 22nd annual Magna Awards program by NSBA’s American School Board Journal. The Magna Awards recognize school boards for taking bold and innovative steps to advance public education. This year’s awards, announced on March 10, honor school districts across the country for outstanding programs that advance student learning and encourage community involvement in schools. An independent panel of board members, administrators, and other educators selected winners from nearly 250 submissions. This year’s three grand prize winners, along with 15 first place, and 15 honorable mention winners, were selected from three enrollment categories: under 5,000 students, 5,000 to 20,000 students, and more than 20,000 students. The Evanston district was chosen a first-place winner in the under 5,000-students category. Evanston won for its “Team Access and Success in Advanced Placement” project, or teamASAP, which is designed to provide comprehensive support for Advanced Placement (AP) students. A Fairview Heights-area group is attempting to cut ties to East St. Louis School District 189 and send more than 30 area children to Grant CCSD 110 and Belleville THSD 201 instead. Organizers of the “Detach 189” group’s petition drive are calling for removing from District 189 the neighborhood known as French Village. Kevin Sheridan, one of the organizers of the Detach 189 group, lists academics as a reason for seeking the detachment. The group aims to raise money for a petition drive to push for the detachment. Group leaders have encouraged Fairview Heights citizens in attendance at some of its recent meetings to sign petitions and to write to the governor’s office, the Illinois State Board of Education, and the District 189 office. Organizers said the group also will support candidates for the District 189 Board of Education who don’t reside in East St. Louis to help accomplish their purpose. The French Village neighborhood, with a population estimated at fewer than 500 people, has previously been the focus of similar detachment efforts, which date as far back as 1972. A push to severe ties to District 189 from 2000 to 2002 failed when an appellate court prevented the detachment. But in a more recent case a smaller detachment was successful; the regional school superintendent in St. Clair County, Susan Sarfaty, said several Fairview Heights homes successfully detached from East St. Louis early in her tenure, which began in 2010. The second year of the Partnership for Assessment of Readiness for College and Careers (PARCC) began on Monday, March 7. The testing window will be open until June 10, a change from the previous year to allow districts additional flexibility in crafting their schedules. Other modifications to the assessment include reducing the test to six or seven units (from eight or nine) depending on grade level, cutting the exam time by 60 minutes for math and 30 minutes for English language arts, and incorporating a more streamlined format. A letter explaining all the changes can be found on the Illinois State Board of Education (ISBE) website. Districts will also see their scores tallied sooner than last year because performance levels have already been set. This will give educators additional time to craft their instruction to better meet specific needs of students. Scoring rubrics and other educational tools aligned with PARCC can be obtained at the Partnership Resource Center. ISBE recently launched an Every Student Succeeds Act (ESSA) webpage to help districts, education officials, and the general public navigate the complex law. Resources on the site include a general overview of the Act, an executive summary, a PowerPoint presentation, and links to U.S. Department of Education documents. ISBE has planned a listening tour throughout Illinois in the coming months, with details to be announced soon. The U.S. Department of Education has also recently advised states with approved Elementary and Secondary Education Act flexibility waivers to continue implementing flexibility requests through the remainder of this school year. A webinar will be hosted for Focus or Priority identified schools to provide guidance in developing and submitting school improvement plans using the Rising Star continuous improvement planning system tool. Click here to register for the March 22 webinar. ISBE has provided a FY 2017 forecasting tool that can be used in conjunction with these reports to aid in calculating the estimated GSA payment for the coming year. IASB has made it a goal to expand the use of technology-driven communication. From targeted email delivery to online blogging integrated with Facebook, Twitter, and YouTube accounts, online contact has become a primary component of the Association’s connection with its members and the public. 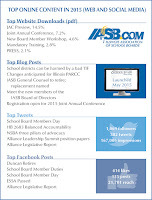 The March/April Illinois School Board Journal offered an in-depth look at IASB’s digital engagement and quantified results for the various online platforms currently in use. Below is a summary of the article. 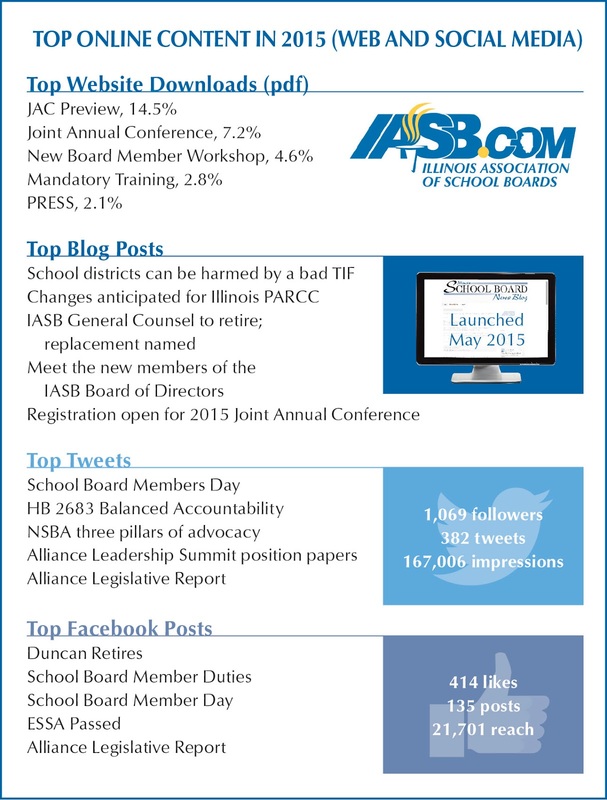 IASB’s most recent online outreach is the Illinois School Board News Blog, which evolved from the Association’s monthly newsletter, The Illinois School Board Newsbulletin. The Newsbulletin officially became the News Blog in May 2015. The News Blog gives the Association an ability to report on topics of interest and timely information in a format that can be accessed at home, work, or on mobile devices. Updates or corrections are made instantly; links go to live sources; and viewers can share information with other users without leaving the blog site. In its first eight months, the News Blog has posted nearly 300 news articles and announcements, generating more than 27,000 “page views.” Popular topics include legislative activities, legal opinions and court cases, local school district issues, and division news, awards, and events (see the accompanying chart). IASB’s social media accounts were launched in September 2014. Both Facebook and Twitter have become popular online portals where Illinois school leaders can find, comment about, and share information that matters most to them. With the House of Representatives on an extended spring break, the Illinois Senate was in Springfield this week for legislative action. As is typical with this time of year, most of the action took place in committees. The most significant news of the week could turn out to be Senate President John Cullerton’s announcement that he would not pass an education budget until there is education funding reform. Cullerton also requested a district by district breakdown of Governor Bruce Rauner’s plan to fully fund the foundation level at $6,119. On Tuesday, March 8, the Senate Education Committee took up Senate Bill 2823 (Koehler, D-Peoria) which provides flexibility in selling student-constructed homes. The bill, an Alliance initiative, was approved by the committee unanimously and now awaits a full vote in the Senate. For more on SB 2823, click here. When Governor Rauner delivered his budget address in February, he laid out two choices for the General Assembly. The first, and preferred choice, was a budget that was a mix of “Turnaround Agenda” items, cuts, and new revenue. However, the second choice, giving Rauner broad authority to sweep funds and make cuts, seems to be getting the most attention right now. The legislation which embodies that idea, SB 2789 (Radogno, R-Lemont), was discussed at length in Senate Executive Committee but no vote was taken. Click here to read the full Alliance Legislative Report (99-38), including bill action from the week and bills scheduled for next week. Illinois high school graduates rank 11th in the nation for the percentage of students scoring high enough to receive college credit on Advanced Placement exams, according to a state report released on March 8. 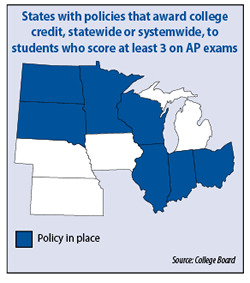 Among last year’s graduates, 25 percent received an AP exam score of at least 3 on the College Board Advanced Placement exams during their high school years, the Illinois State Board of Education added. Nationwide, 22.4 percent of last year’s graduates achieved a score of 3 or above. The exams measure a student’s content mastery of college-level studies in specific academic disciplines. Under a state law adopted last year, all public universities and public community colleges in Illinois are required to award college credit to students who submit scores of 3 or higher, starting in the 2016-17 school year. Illinois continues to boast record numbers of graduates taking AP exams, with a total of 48,627 graduates (nearly 38 percent) taking at least one AP exam, more than double the amount of graduates who took the exam in 2005. The percentage of Illinois graduates who scored a 3 or higher grew by 11.7 percentage points from 13.3 percent in 2005 to 25 percent in 2015. Illinois is fourth in the nation for the largest percentage point increase over the last decade. The latest AP results for Illinois are reported by the ISBE here. What’s on IASB’s legislative agenda for 2016? Take a look at this video of Governmental Relations Director Deanna Sullivan and Assistant Director Zach Messersmith discussing the priorities for this year’s spring session. If the video is not displaying correctly in your browser, click here. School officials seeking guidance on the Illinois Open Meetings Act (OMA) and Freedom of Information Act (FOIA) can now access this information in an updated publication produced by Klein, Thorpe, and Jenkins, Ltd. of Chicago. Letting the Sunshine in: School Board Meetings and Records is a revised booklet that combined two previous documents, School Board Meetings: Requirements under OMA and School Board Records: Requirements under FOIA. The pamphlets were last updated in 2010 and a number of changes have been made to the FOIA and OMA statutes since that time. “Letting the Sunshine in” is current on both public access laws up to July 2015, with the new publication containing a summary of all the changes that have occurred since the last revision. Among the new OMA provisions are required training, posting timelines, and subject matter content that needs to be made public prior to a meeting. Changes to FOIA include the definitions of “recurrent requester” and “voluminous request,” allowing for a different procedure and additional time for a public body to respond. Also included are requirements for commercial records requests, monetary charges for burdensome requests, and exemptions for reports submitted to the School Security and Standards Task Force. The revised publication provides a detailed overview of whom and what the Acts cover, requirements contained in each law, what public bodies need to do to remain in compliance with the statutes, and a brief question and answer section. Also included is an easy-to-use table of contents and a number of appendices that provide examples of forms, requests, and letters that may be useful to boards of education. IASB would like to thank James Bartley and Gregory Smith, as well as the entire Klein, Thorpe and Jenkins, Ltd. of Chicago team for their pro-bono work in putting together this informative guide. The following are editorials, commentaries, and opinions from various media sources regarding public education in Illinois, collected in February 2016. Click on each headline to read more. The application process for IASB’s School Board Governance Recognition is now open. This award recognizes boards of education that have actively and effectively modeled their governance behaviors as outlined in the Association’s six Foundational Principles of Effective Governance. The focus of the program is to acknowledge full board development and participation, instead of individual board member accomplishments. “The School Board Governance Recognition aims to honor select boards for the great work they do in governing their school system,” said Dean Langdon, IASB’s associate executive director for board development and TAG. 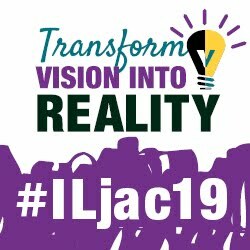 “Throughout Illinois, numerous school boards are establishing a vision for their schools, connecting with their community, modeling a productive relationship with their administration, and monitoring student achievement,” Langdon added. Practicing effective governance behaviors by participating in board development programs and events. 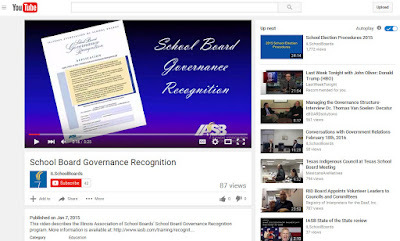 Applications for the School Board Governance Recognition are posted on the Members Only website, under the “Your IASB Involvement” tab. A checklist of the criteria necessary to qualify for the award is available on the IASB website. Additional information and guidance about the application process can be found in an online tutorial video. The recognition covers a two-year period so honorees from 2015 need not apply. School boards that earn Governance Recognition Awards will be presented with plaques at IASB’s fall division meetings, and photos of successful applicants will be on display at the 2016 Joint Annual Conference in November. Questions about the award program should be directed to Peggy Goone, ext. 1103, or by emailing her at: pgoone@iasb.com. Funding for Illinois public schools costs more than 14 times as much money as the state lottery brings in for state coffers each year, and the lottery offers no potential salvation for lagging school funding. The revenue contribution to state funds from lottery sales grew between 2005 and 2014, rising from $614 million per year to $813 million per year. When viewed as a percentage of the state’s K-12 education appropriations, however, lottery revenue declined over the decade, falling from 8.8 percent in 2005 to 6.6 percent today. When ticket games were launched in 1974, lottery dollars were equal to 20 percent of state education funds. Unfortunately, schools cannot expect to see that trend in the lottery reverse itself. 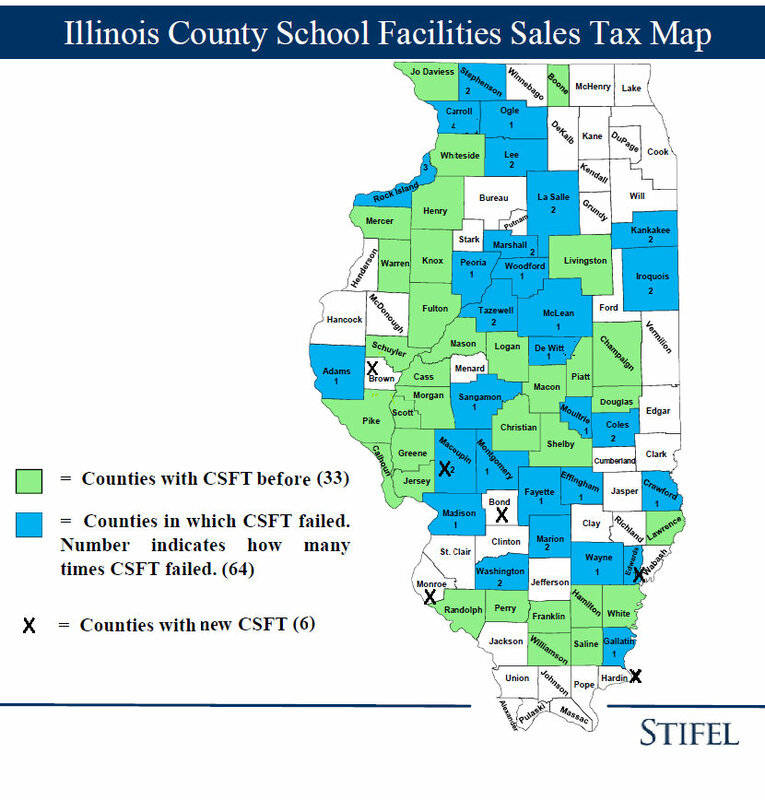 The lottery is just not set up to boost school funding totals, according to a state finance blog, Reboot Illinois, which reviewed the status of the state lottery's relationship to schools on March 5, 2015. “It’s not gravy added to the main course of state money for schools," wrote Matt Dietrich, executive editor of Reboot Illinois. In fact, "state funding for education still is well below what the Legislature has established as an adequate per-student funding level,” according to Dietrich. The Illinois State Board of Education (ISBE) has confirmed that Illinois, which has offered the ACT to Illinois high school juniors for 15 years, is switching to the SAT. The change was announced in late 2015 and finalized, after a protest by the ACT over the procurement process was denied on Feb. 11. The procurement process decision also included alignment to Illinois Learning Standards, validity and reliability, readiness of training for educators and parents, opportunities for student preparation and practice, reporting options, and customer support. This is a major shift for Illinois students. In 2015, 157,047 Illinois students took the ACT. Fewer than 6,000 students took the SAT, and they likely took the ACT, too. Of that 6,000, 3,963 were public school students. Illinois follows Michigan in the switch. Over the years, regional favoritism was part of the conventional wisdom surrounding ACT vs. SAT. East Coast colleges and universities traditionally relied on the SAT, the Midwest favored the ACT, and western schools used both. Today, most schools accept and value the ACT and SAT equally. The March/April issue of The Illinois School Board Journal continues the collaboration with The Ounce of Prevention Fund to communicate with school boards the importance of early learning to positive, long-term student outcomes. As boards of education across the nation deal with a scarcity of teachers and substitutes, changes to Illinois admission standards have made it harder for students to become teachers -- McKendree University's Jim Rosborg and IASB's Patrick Rice tell the story. Also in the Journal, IASB’s digital engagement is on the rise, including this News Blog, but caution is necessary for board members when considering participating in unrestricted discussion platforms. 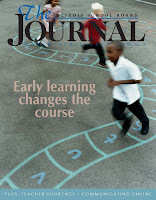 The Illinois School Boards Journal.